If the Colosseum, the Pantheon and the Vatican are all a “been there, done that” type of situation but you still want to visit Rome, there are some exciting alternative sights to see in this historic and fascinating city. From saints' skulls to ancient optical illusions, you are literally spoiled for choice. When enjoying private tours of Rome, you can experience so much more than the normal touristic route and the following are just some of the more unusual sites to visit. 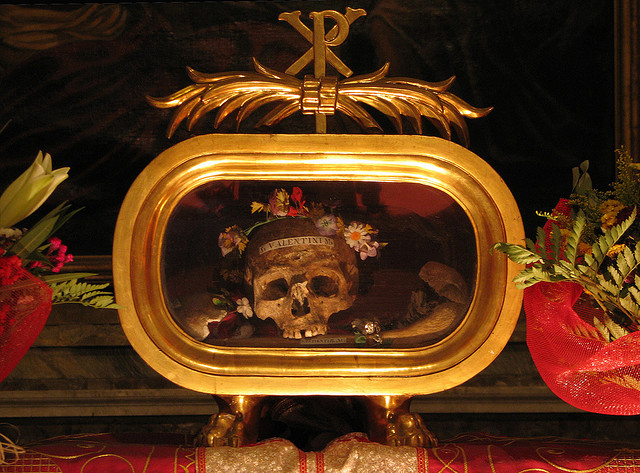 You can visit San Silvestro in Capite and see one of four skulls claiming to belong to the beheaded St. John the Baptist. Apparently the other three are located in churches in France, Germany and Syria, with those holy places claiming they have the actual skull. However, it is an interesting visit and who knows? Maybe the skull in Rome is the real deal. When entering the church, the skull is in the first chapel to the left of the entrance. There is also a beautiful stained glass window, depicting St. John’s head on a plate. 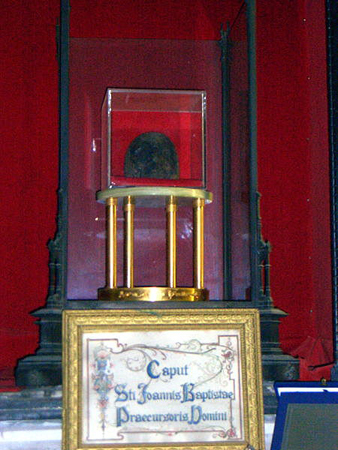 Speaking of people’s heads, you can also see what is claimed to be the skull of St. Valentine, the patron saint of lovers. However, once again, controversy reigns over the relic as there were more than one Catholic saint known as St. Valentine and no less than ten places in the world claiming to house the relic. In the case of the skull in Rome, it resides in a glass reliquary inside a small basilica and is surrounded, rather appropriately, by flowers. Across the forehead, lettering has been painted to identify the owner of the skull as the patron saint of lovers, St. Valentine. According to Atlas Obscura, at least two men by the name of Valentine (Valentinus to be exact) were known in Italy and both died in the late 3rd century. A third Valentine was reportedly located in North Africa at around the same time. However, as a saint, Valentine first gained notoriety back in 496 when Pope Gelasius I dubbed February 14, which was originally part of the Roman festival of Lupercalia, a feast day dedicated to the patron saint of lovers. Photo St Valentine's skull CC BY-NC 2.0 Fr Lawrence Lew, O.P. One mythological tale speaks about Valentine as a patron of lovers who helped early Christian couples marry in secret, but this story dates back to the 14th century and the writings of Geoffrey Chaucer. Whether the skull is, again, the real deal is unknown, but the Basilica of Saint Mary in Cosmedin is still worth a visit as it is very old and stands on the site of an ancient Roman temple dating to the second century BC. The current church dates to the 8th and 12th centuries, including the crypt, located beneath the altar. The skull itself is on a side altar on the left side of the church. Take your loved one to the church on St. Valentine's Day for a different romantic treat! While there, visit the famous Bocca della Verità (Mouth of Truth) which is located close by and was made famous in the film “Roman Holiday” starring Audrey Hepburn and Gregory Peck. 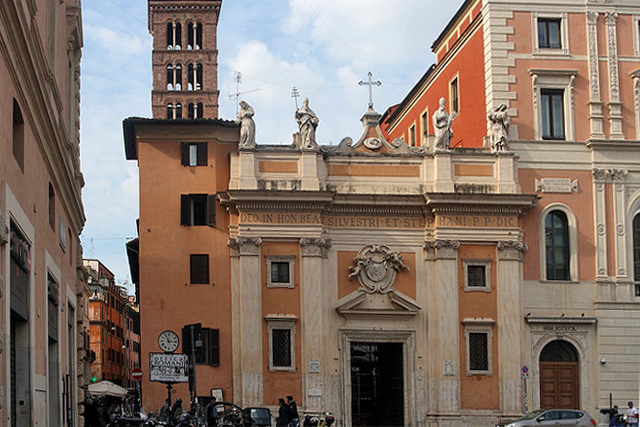 For the ultimate in optical illusions, head to the Jesuit church of Saint Ignazio in Rome. When the church was built, it was planned to include a glorious dome, but due to budget constraints (i.e. they ran out of money), in 1642 the plans for the dome were scrapped. Instead of completely dropping the idea, however, a Jesuit brother and painter by the name of Andrea Pozzo painted a life-size illusion of a dome that would fool the eyes of visitors (as long as it was viewed from the right angle). Painted between 1685 and 1694, his masterpiece still fools the eye today. 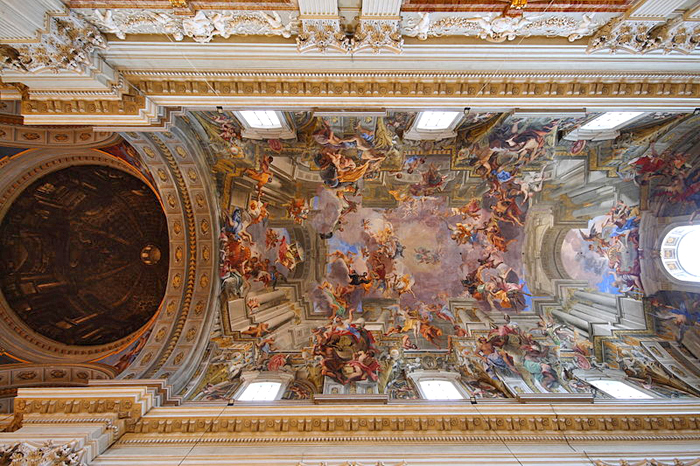 Below is a photo of the dome (left) and the rest of the incredible art on the ceiling of the church. The technique used by the painter is known as quadratura, which is a mixture of geometrically accurate architecture in forced perspective, combined with elements of fantasy, including cherubs and floating saints. The best way to view the illusion is to keep your eyes low until you reach the circular marble marker, indicating the ideal vantage point for the dome illusion.